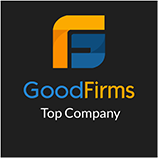 Now the Technology is coming in help for the Mobile SEO Community, by providing Tools that we use day to day in our Internet marketing business. 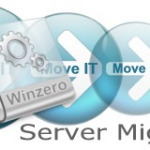 These tools enable us to do our business on the move. 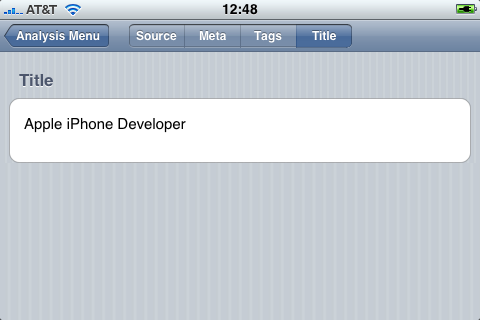 So now let us see the SEO Tools used for the mobile platform. 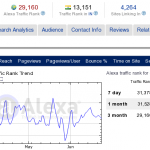 We are going to about an important SEO tool necessary for on page optimization. 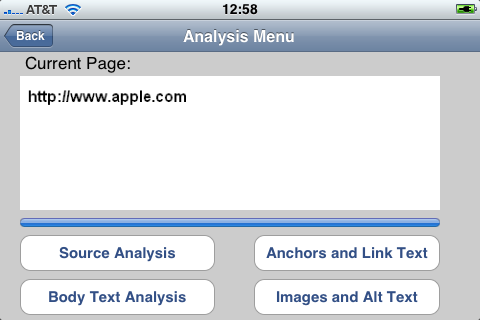 ProSEO– is a Content Analyzer Application used in the iPhones. For those (iPhone users) who want to know how well their Web pages are optimized and how far their Web pages are Search Engine friendly, this is a good tool. 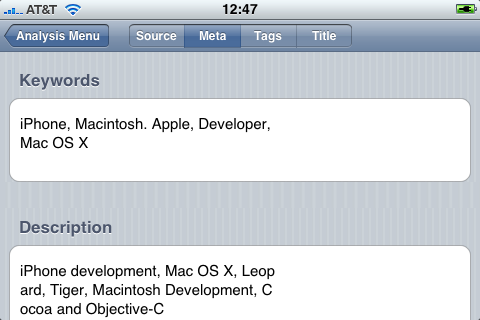 ProSEO normally uses a browser similar to Apple safari, for the user to surf the page that the user wants to analyze. It has a list of bookmarks fo that, the user can bookmark the web page of his/her interest by simply pressing the ‘+’ button in the bottom left corner of the screen. 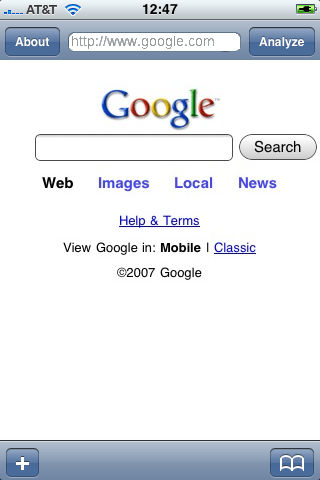 Simply tap the address bar above & enter the URL of the Website/web page you wish to go to. And after you have entered/loaded your website, just press the ‘Analyze’ button on the top right corner of the screen. You may choose between the 4 analysis on the button menu below the progress bar. The window above shows the user the full URL of the page being analyzed. 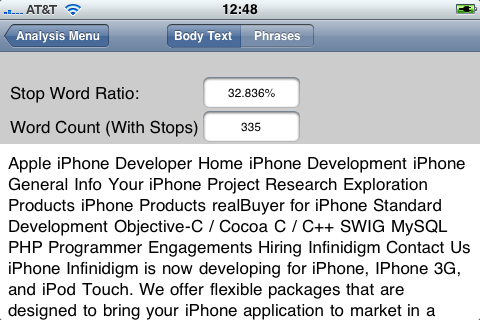 After the analysis is complete, the progress indicator will show a solid blue bar, and the “Back” button will appear. You may choose between the 4 analysis on the button menu below the progress bar. List of all the META tags in the source code. Content of the title tag. The complete set of source code. 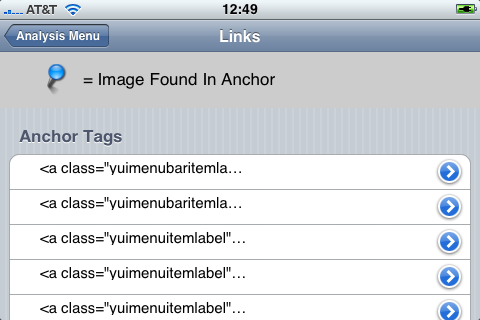 The Keywords and Description are extracted. The title listing shows the complete title. Percentage of body words that are stop words (Stop word ratio is a measure of the number of times words such as “the,” “and” and other oft-used words appear on a page. Search Engine bots commonly used words like this.) So you can know how effective your marketing page is by knowing how much of what you’ve written will be ignored by the bots. The total word count of the document for words that are not determined to be numbers. Phrase counting – this helps you determine repetitive phrases in the document. The complete set of text that is extracted from the whole page. The title tag’s text will appear here at the top. The number of words are counted and displayed as well as a metric called the “Stop Word Ratio”. Stop word ratio is a measure of the number of times words such as “the,” “and” and other often-used words appear on a page. Search bots ignore commonly used words like those.” ProSEO uses a proprietary list of German and English stop words. 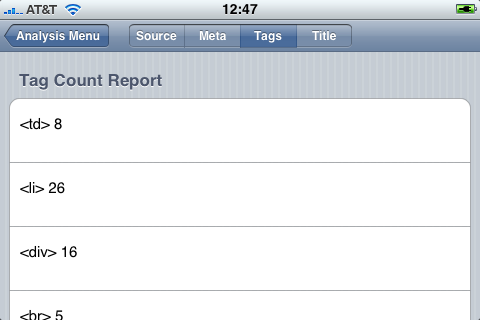 The phrases tab allows you to alter the size of the phrases the analyzer determines from the content. You must use the slider to adjust the phrase length, because the phrase length field does not accept direct entry. You can remove stop words from the phrases by selecting the Stop words Removed switch. 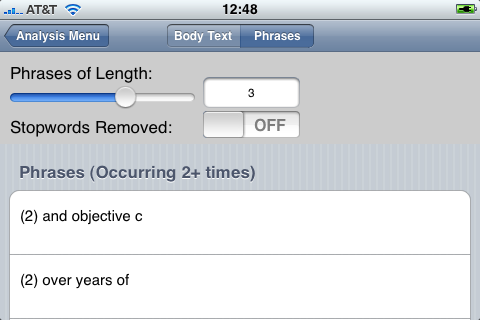 Only phrases at the desired length are show along with the number of times that they appear. When you remove stop words, there may be repeat phrases in the list; and this is normal. 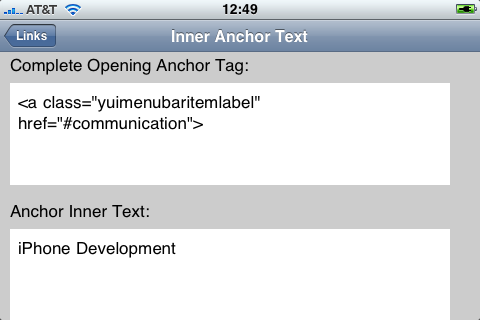 The anchor tags in the document — and, specifically if there is an image in the link text. 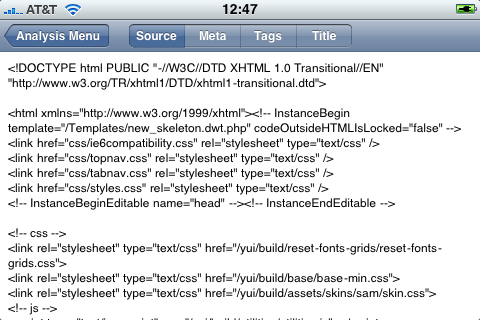 The inner HTML of of the tag. This is the same as the link text. This is a listing of all the outbound links on the page. A small blue pin appears next to the link if there is an image tag before the closing anchor tag. Images cannot be seen or accessed by pressing the blue pin. Its presence is purely informational. Use the blue pin to determine how many links contain nothing but images. 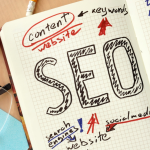 There is room for improvement on your SEO by providing meaningful link text for these. The anchor listing displays the opening anchor tag and the lower window displays the text for the anchor tags. 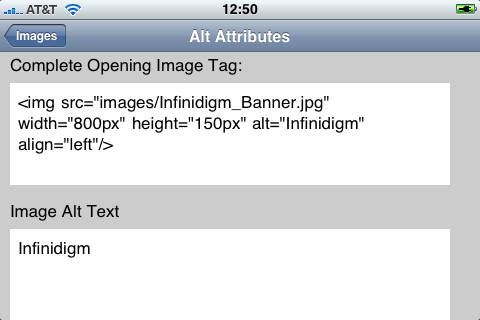 This is a listing of all the images/image tags in the document. 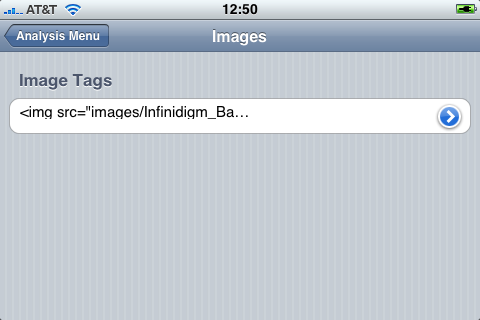 The detail view of the image shows the entire image tag and also the Alt text supplied as an attribute within the image tag. Some search engines give you credit for providing Alt attributes. ‹ Google Analytics Filters – Are you Making the Most of it?